The second member of the association to die, Able Seaman Alfred Bashford, met his end half a world away from Walter Markey, aboard the ill-fated HMS Good Hope off Coronel in Chile. Alfred was born on 19 November 1885 at Nutfield. He was the son of Alfred Bashford and Mary Harriett (nee Day). There is some evidence that he was usually known as Fred, presumably to avoid confusion with his father. Alfred was from Bletchingley and Mary from St Mary’s, Southampton, they married at St Peter and St Paul, Nutfield on 21 June 1879. William Day Bashford was born in 1880, baptised at St Peter and St Paul’s on 6 June 1880. Twins Allen Alfred and Annie Bashford followed in 1882, baptised on 9 April, but sadly died just two days later and were buried in the churchyard on 15 April. The 1911 census suggests two more children also died in infancy, but it has not yet been possible to identify them. By the 1891 census the family were on Church Road, Nutfield. Alfred senior (53) was working as an agricultural labourer, William (10) and Alfred junior (5) were both at school and Mary (44) was a housewife. They also had a William J Bowley (21), a blacksmith, lodging with them. At this point there doesn’t appear to be any ringing in the immediate family, but there were father and son John Bashfords in Bletchingley, successively landlords of the Red Lion and well known ringers. By 1901 most of the family were still in Church Road, but Alfred junior was at Pattison Court Stables, and employed as a hall boy, presumably at Pattison Court itself which appears to have been the home of the Nickalls family. Alfred senior was still working as an agricultural labourer, William as a gardener. On 16 September 1901 Alfred joined the Royal Navy as a Boy 2nd Class, his previous occupation is shown as “garden boy”. He was 5’4″ tall and described as of ruddy complexion with grey eyes and brown hair. He was briefly at the training establishment HMS Impregnable before being posted to HMS Lion on 21 September. He was re-rated as Boy 1st Class on 19 June 1902. He transferred to HMS Minotaur on 18 July, and to HMS Agincourt on 28 January 1903, and then briefly to HMS Camperdown from 17 April-5 May, joining HMS Hawker on 6 May. On reaching the age of 18 on 19 November 1903 he began his full 12 year engagement and was re-rated ordinary seaman. He had now grown to 5’6.5″. On 18 May 1904 he transferred to HMS Exmouth. 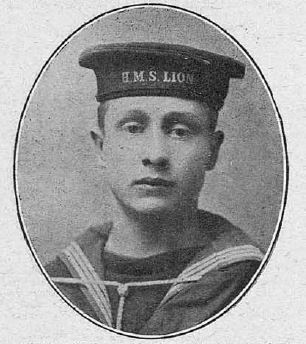 He was re-rated able seaman on 5 April 1905. He was posted to the Portsmouth naval barracks, known as HMS Victory I, on 2 May 1905. He then went to a torpedo course on HMS Vernon from 14 May-23 September, before returning to Victory I until 28 May 1906. He joined HMS Centurion on 29 May, on 25 May 1907 he returned to HMS Exmouth. In 1908 he applied to buy himself out of the navy, in preparation for this he returned to Victory I on 28 June. After paying £12 and agreeing to join the Royal Fleet Reserve he left active service on 16 July 1908. There are various reports of an A Bashford ringing during this period, but this is presumably the father. However, there is a report of a quarter peal of Grandsire Triples at Redhill on Sunday 11 October 1908 (which also included W Streeter, who also appears on the roll) featuring A Bashford, which is after Alfred junior left the navy. We can also see that William Bashford seems to be among a number of ringers you moved to Farnham to work at the plant nursery run by Charles Edwards, another ringer, as he is listed in several of the reports of ringing previously found in relation to John William Russell. After this, no further reports of an A Bashford ringing occur until a one of 720s of Oxford and Kent Treble Bob on 11 March 1911 at Kingswood. This included A and W Bashford, along with J W Russell and W Cheeseman who also appear on the roll of honour. Following this there are a frequent reports, moving into quarter peals and peals. Several other men named in the roll of honour also appear in these. In several, Alfred is the conductor. He is often listed as F or Fred Bashford, and on some occasions this appears to have been incorrectly expanded to Frederick. At the 1911 census the family were all living at High Street, the Village, Nutfield. Alfred junior and William were both working as labourers in the fullers earth quarry at Nutfield. Alfred senior was now a roadman on the highway. In 1913 William emigrated to the US. He left Liverpool on the Mauretania on 22 March 1913 and arrived in New York on 28 March (see the Ellis Island records and UK records). He gave his occupation as gardener. As his intended residence in the United States he says he is going to a friend in Boston, Dr A P Nichols – one of the leading ringers in the US (it appears from some reports that there had been a deliberate policy of recruitment from England). William then appears in various ringing reports of the Boston ringers. In May 1914 he moved to Connecticut for a better job. In January 1915 William married a Miss Mulvenny, an event marked by ringing at Hingham, Massachusetts on 31 January. Alfred senior died in late 1914. In 1914 a mobilisation of the Royal Fleet Reserve was already planned for mid-July. This was given added urgency by the assassination of Archduke Franz Ferdinand at the end of June. Alfred junior was posted to HMS Good Hope, an elderly cruiser activated from the Third Reserve Fleet, whose crews were mostly made up of reservists, on 13 July. There was a fleet review at Spithead, and then the reserves would have been demobilised, but in view of the international situation they were kept on active duty, but allowed leave. When the navy was fully mobilised on 31 July he returned to HMS Good Hope. Good Hope was assigned as the flagship of Rear Admiral Christopher Cradock. His squadron was despatched to the South Pacific to counter a German squadron under Maximilian von Spee. The British squadron was composed entirely of outdated ships, and one converted from an ordinary merchantman. On 1 November the two squadrons sighted each other. Cradock, though he knew his ships were outclassed, decided to fight, possibly influenced by earlier events in the Mediterranean which led to Cradock’s friend Ernest Troubridge, who was now facing court martial after declining to engage with two German ship in somewhat similar circumstances. Good Hope was rapidly sunk, and soon followed by HMS Monmouth. Both sank with all hands, around 1600 men. A memorial peal was rung at Nutfield on Wednesday 25 November. Today’s ringers remembered the centenary of his death with a quarter peal on 1 November 2014. Mary Bashford was now about 67, a widow, with no children living nearby to support her. William Bashford returned from the US, arriving at Liverpool on 28 June 1915 aboard the SS St Paul. Having made the trip home, he met up with various old friends to ring throughout July at Nutfield and Merstham. He returned to the US, with his mother, again on the SS St Paul leaving on 31 July from Liverpool and arriving at New York on 7 August. This entry was posted in November, Nutfield, Regular, Royal Navy and tagged Alfred Bashford, Battle of Coronel, Bellringing, First World War, Nutfield on 01/11/2014 by davidunderdown95. Six ringers went to war from SS Peter and Paul, Nutfield. Alfred Bashford did not return, the second member of the assocaition to die, and the only naval casualty. A former regular seaman who had joined the Royal Navy as a boy in September 1901, on turning 18 in 1903 he commenced a full 12 year term of service, but purchased his discharge in 1908, on condition that he serve the rest of the time in the reserve. The fleet was mobilised in July 1914, and reserves recalled, Bashford among them. He was posted to the elderly armoured cruiser HMS Good Hope aboard which Rear Admiral Craddock hoisted his flag. His small squadron of second-rate ships was sent to the South Pacific where it was known a German squadron, commanded by Admiral Graf von Spee, was operating. On 1 November 1914 the two squadrons met in the Pacific, not far from the Chilean port of Coronel. The engagement was a disaster for the Royal Navy with Good Hope and HMS Monmouth sunk with the loss of over 1500 men. Though the Germans suffered just three men wounded, the battle used up large quantities of their amunition, contributing to their defeat in the subsequent Battle of the Falkland Islands where over 1800 German sailors were killed. Bashford is commemorated on the Portsmouth Naval Memorial – none of the dead of this battle have a known grave. This entry was posted in Nutfield and tagged Alfred Bashford, Bellringing, First World War, Nutfield on 17/01/2013 by davidunderdown95.